Sorry, this job expired on Mar 4, 2019. Below are other jobs that may be of interest to you. Are you excited to learn? Want a company where you have growth potential? Sick of being undervalued and overworked? Then you have found the right place! We are searching for talented, energetic Chef de Cuisine to lead our hardworking team! Opened in May 2016, Autograph Brasserie is the newest addition to the Fearless Restaurant collection. Located in the former location of James Beard’s L’Auberge and George Perrier’s Georges, the building's rich history and French influence framed the inspiration of a concept owner Marty Grims had for over 20-years. Featured throughout the restaurant are over 1000 celebrity autographs, albums, and authentic photographs celebrating those individuals that have impacted popular American culture. Qualified individuals will be a natural leader and have impeccable cooking technique. Health/dental insurance, short-term disability, MAJOR vacation perks, Employee Dining Program @ Fearless Restaurants, Field Trips! 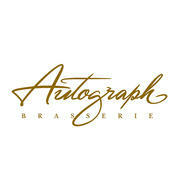 Autograph Brasserie, part of Marty Grims' Fearless Restaurants, opened in 2016 in the former location of Peppercorn and George's. The building's rich history and French influence framed the inspiration of a concept Grims' had for over 20 years. Featured throughout the restaurant are over 1000 celebrity autographs, music albums, and authentic photographs celebrating those individuals that have impacted popular American culture.